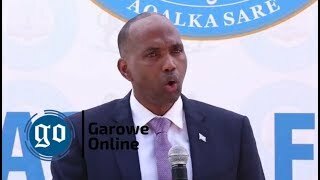 GAROWE, Somalia July21, 2014 (Garowe Online)-Lawmakers in Somalia's Puntland parliament have approved a controversial media law as Media Association of Puntland (MAP) rejected the outcome of the parliamentary vote on Monday, Garowe Online reports. Of the 37 MPs in the parliament hall, 32 lawmakers voted in favor of passing the media bill, four MPs abstained on voting while one lawmakers voted against the bill labeled as ‘restrictive' by media fraternity in Puntland. Speaking to reporters shortly after the approval of Parliament, speaker Saed Hassan Sheikh declared that journalists will comply with the law if President Abdiweli Mohamed Ali Gaas signs. Protesting against the new bill, MAP announced that the new bill is not representative and dealt blow to freedom of expression as well as independence of journalists. 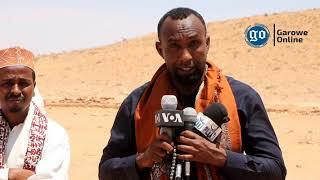 The Deputy Chairman of Media Association of Puntland Mohamed Dahir Yusuf (Saalim) who held a press conference in the state capital of Garowe said the law is not inclusive since journalists and Farole administration agreed on another media bill which was not presented to the parliament by Ministry of Information. 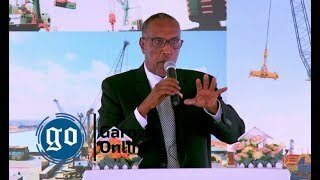 "I urge President Gaas to avoid giving green light to this restrictive law because it doesn't deserve to be signed and the media law approved by parliament runs counter to the constitution," said Saalim. MAP listed the controversial points as, the legitimacy of granting Identification Cards to journalists by Ministry of Information and trial of journalists when arraigned in courts, amongst others. 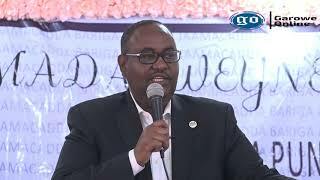 Puntland's Minister of Information Abdiweli Hirsi Abdulle (Indho Guran) criticized media members for irresponsibility. 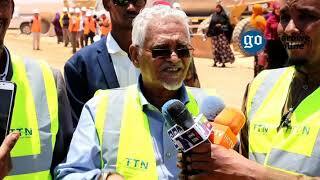 Indho Guran noted that Puntland journalists are required to abide by strict laws. 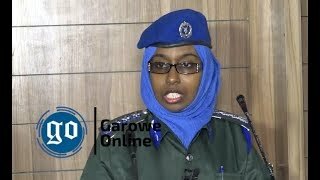 On Sunday evening, Garowe Police arrested freelance reporter Abdalle Adan Adde over undisclosed reasons, making the first media worker to be detained after the election of Gaas as Puntland president in January. He is being held at Garowe Central Prison for interrogation, sources stated. Adde worked for UK-based Somali channel, Universal TV but over the last few years he had been writing about Puntland politics.